2018 Summer Book Bingo is upon us, so let the booklists begin! This list will focus on that pesky category First In A Series. There are many, many beloved series out there, many of them in genre fiction. Hopefully there will be a little something for every reader here. Whether you’re an intrepid or an armchair traveler, visiting an unfamiliar place is an enriching experience. From Albania to Zimbabwe, there are no shortage of travel books to transport you to other locations. But how we travel is just as important as where we go, and here some books to make you a smarter traveler — an earn a square on Book Bingo! How do you determine what’s essential to take with you? Forgetting essential items can be a drag, and overpacking and lugging overstuffed suitcases is equally frustrating. Those seeking advice should check out How to Pack by Hitha Palepu, who has traveled half a million miles and knows of what she speaks. Lonely Planet has their own guide, How to Pack for Any Trip, which includes illustrations the whole family can enjoy. The Return of Summer Book Bingo! 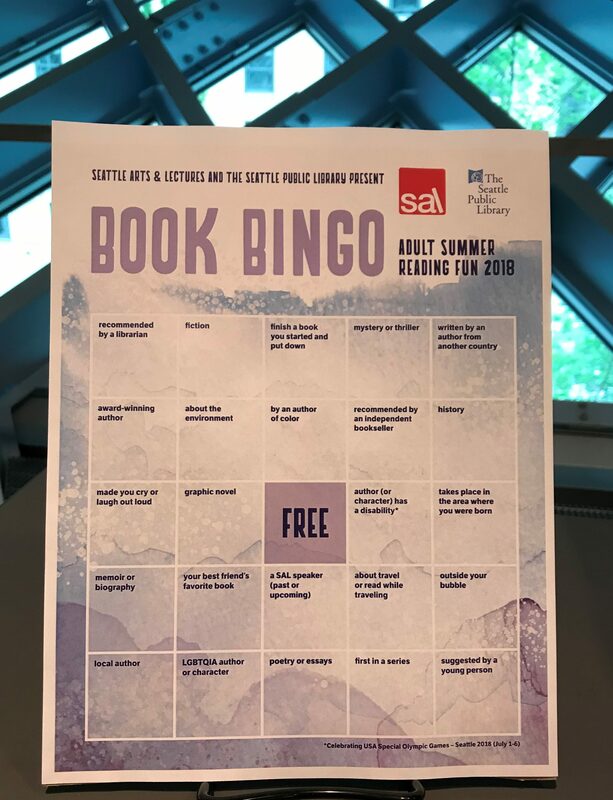 Author rablogsplPosted on May 24, 2018 May 29, 2018 Categories BOOKSTags #BookBingoNW2018, Adult Summer Reading Program, Book Bingo, Book Bingo 2018, Seattle Arts and LecturesLeave a comment on The Return of Summer Book Bingo!